Products of pork with mushrooms and red wine prepared for 60 minutes. The pork is cut into pieces and fry on all sides for a few minutes. Remove from the pan and in its place put the finely chopped onion, carrots, garlic and celery. Fry for a few minutes until tender and add the wine. Seasoned with salt, paprika, allspice and bay leaf. Once the wine has evaporated, add the tomato paste and a little water. The mixture was stirred and transferred to a cooker, along with the pig. Make up with water, so as to cover the meat. Boil for 20-30 minutes, then add the sliced mushrooms into strips. Boil for another 30-40 minutes until complete softening of the meat. Shortly before he was ready, the dish is thickened with flour fuzzy little water. Preparation time 60 minutes. 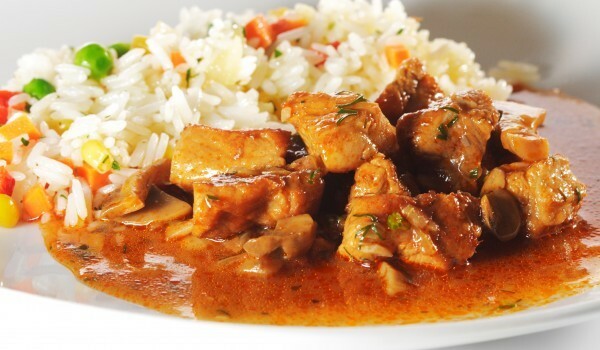 Here’s another option for the preparation of pork with rice. 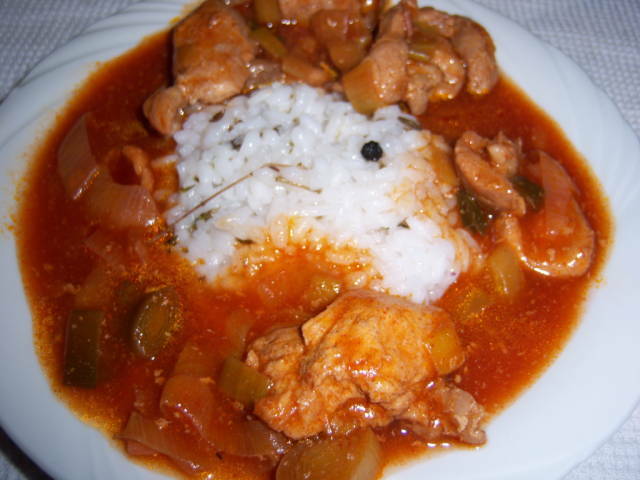 800 g pork, 2 onions, 2 leeks, 1 cup red wine, 1 tablespoon flour, 5 tablespoons tomato paste, 1 teaspoon paprika, 1/2 teaspoon pepper, salt, 1 bay leaf. 1 cup rice 3 cup water, 1 tablespoon oil. Pork (800 g) cut into pieces, onions (2 heads) of crescents and leeks (2 sticks) – on wheels. Saute meat and onions until soft. Then add enough water to cover the meat cooking and remains poluomekvane pork. Add red wine (1 cup) flour (1 tablespoon) mixed in tomato puree (5 tablespoons) and spices. The dish is boiled until ready by occasionally stirring. Serve with a side of rice (1 cup) cooked in salted water (3 cups) until ready and seasoned with butter (1 tablespoon). Serve hot, sprinkled with chopped parsley. Preparation time 45 minutes.